The election in Germany’s richest province Bavaria today has turned into a drama for Chancellor Angela Merkel’s Conservatives as they end up with only 35% of the vote, their lowest finish in 70 years of elections in the Bayern region. Ms. Merkel’s party was blamed for her failed immigration policies and the Bavarian parliament will for the very first time have to welcome the AfD into their midst as anti-immigrant right-wing party took some 11% of the vote share. The Christian Conservative party CSU now only holds 35% of the voter’s trust anymore (if exit polls turn out correct- and even in a coalition with the left-wing SPD (which sees a dramatic slide to only 10%) it would no longer have a majority in the province. The whole ordeal will be a major problem for Chancellor Angela Merkel who still has the largest party but can no longer govern on a provincial level with the same party as the does federally. Related coverage: <a href="http://thegoldwater.com/news/38485-Germany-Election-Girl-14-Mocked-For-Racist-Poem-About-Immigrant-Stabbings-Video">Germany Election - Girl (14) Mocked For ‘Racist’ Poem About Immigrant Stabbings (Video)</a>. 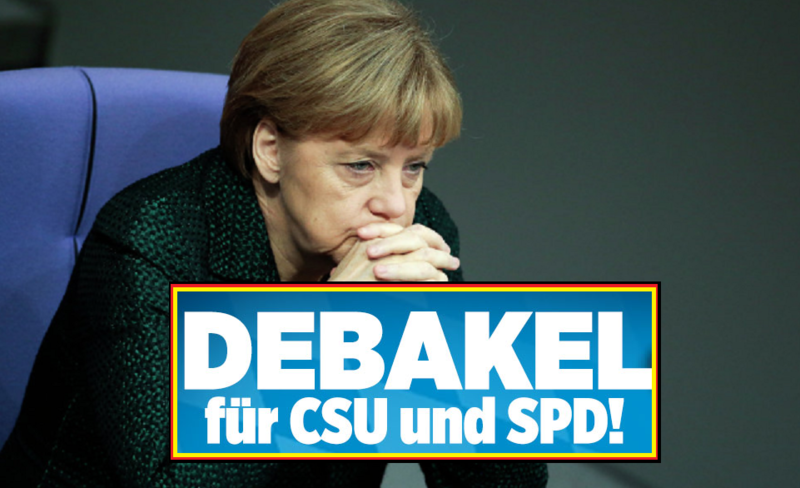 It remains to be seen whether her left-wing coalition partner SPD will allow her to choose another partner on a smaller lever (probably Ms. Merkel would have to go with the Greens in Bavaria) and see their support federally shrink further. The anti-immigrant AfD will enter parliament for the first time after it scored some 11% of votes. It appears that the right-wing party pulled support from the CSU's conservative base with its hard-line policy vision which calls for closed borders and deportation for any migrant convicted of a crime. The Free Voters, another regional right-wing protest party, is also likely to enter parliament having secured 11.5%. At 72.5%, voter participation was at its highest level for almost 40 years, meaning that many came out to punish Ms. Merkel’s government. All are fed up with the globalist (help only themselves) agenda.